Since we were young children we are implanted with the notion of trust. We are taught that it is a cornerstone for interaction in society. It’s a concept that’s deeply interlaced with our core values as people. All aspects of our daily lives are affected by the level of trust we have with individuals, businesses and technology. For example, the extent of our trust is a critical factor when evaluating a new technology as a value for potential business solutions. Today, we will explain why blockchain technology is such a remarkable mechanism for enabling trustless consensus. Although this can be a complicated subject, we will explain it in laymen’s terms. Given the importance of trust, it sounds like an oxymoron when you hear that blockchain is “trustless trust” system. So, to understand how “trustless trust” applies to blockchain, let’s first take a look at the history of blockchain. Satoshi Nakamato, founder of this technology, referred to blockchain as a peer-to-peer version of one party sending another party electronic money without the need or use of a financial intermediary. The most significant aspect of this statement is ‘not involving a financial intermediary’. There is a strong argument to be made that the only reason why banks still exist today is because, the general consensus is that they are still important and relevant. Financial systems have today evolved to where the banks have been a necessity until now. Start a job and before you get paid, you need to provide your banking info. Want to pay for something without carrying cash? Time to pull out your bank or credit card. Why is this accepted? Simple, we all trust banks and the entire financial system. This is the way we have been conditioned to transact in business. However, blockchain and crypto currencies are beginning to alter this behavior. But the only way for this to become mainstream is to create an environment where the new system of spending money is accepted by everyone. So the main thing that Satoshi Nakamato circumvented was the issue of trust, by creating a system where nobody needed to trust anybody in the system. The system creates the trust by default. He used something called Proof of Work (POW), to create a network of distributed users, and the environment he generated a trustless consensus. By combining proof of work and other concepts like peer-to-peer and clever cryptographic signatures, digital crypto currencies became the first basic application. So why is it trustless? Let's re-examine todays financial institutions and ask ourselves the question, “Why do we trust banks and our entire financial system?” Systems and controls in the banks are trusted because first, we trust that they will not arbitrarily take some or all of our money. Secondly, we trust the information they provide is accurate because there are rules and standards that they must adhere to. But what if that trust was attainable with technology? Where it cannot be wrong and we never have to think, that it cannot be trusted as a result of how the technology works. That is precisely what’s happening with Bitcoin and blockchain today. Eliminating the need for trusted third-party processing through blockchain in the near future, will have a positive influence on everything from business transactions, to property ownership records, to healthcare and government statistics. Once people become comfortable with the technology’s new trust paradigm, we will really begin to realize its true benefits. The important thing to remember is that no technology negates the need for good design and planning. 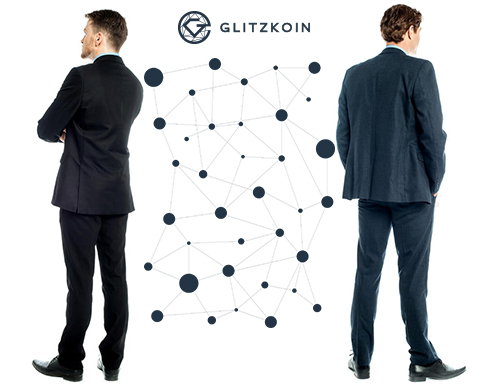 GLITZKOIN shares this vision for the future and has a plan to advance the transparency of the entire diamond trading process and the authentication and certification of the diamonds by using blockchain technology. The selection of the team reflects this vision, we have brought together diamond veterans and the finest talents in blockchain technology.